Every litigator is, involved in the art of persuasion. Litigation is fundamentally about the art of persuasion. Persuasion is a litigator’s daily task: in correspondence, on the phone, with opponents. It is wrong to confine the consideration of this essential skill to the courtroom. Several years ago I wrote what was supposed to be the first in a series looking at guides on advocacy and persuasion. That “series” got overtaken, primarily by the posts on guidance from judges. It seems wise to start again. 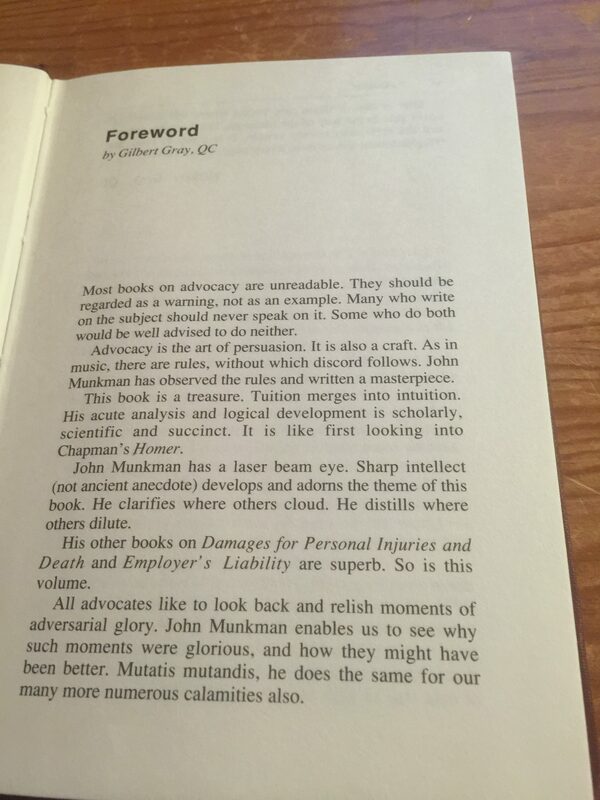 There are many books on advocacy and it is worthwhile having a look at some of them from the point of view of usefulness to the civil litigator. I am starting with a gem, as much a work of literature as it is a book on advocacy. 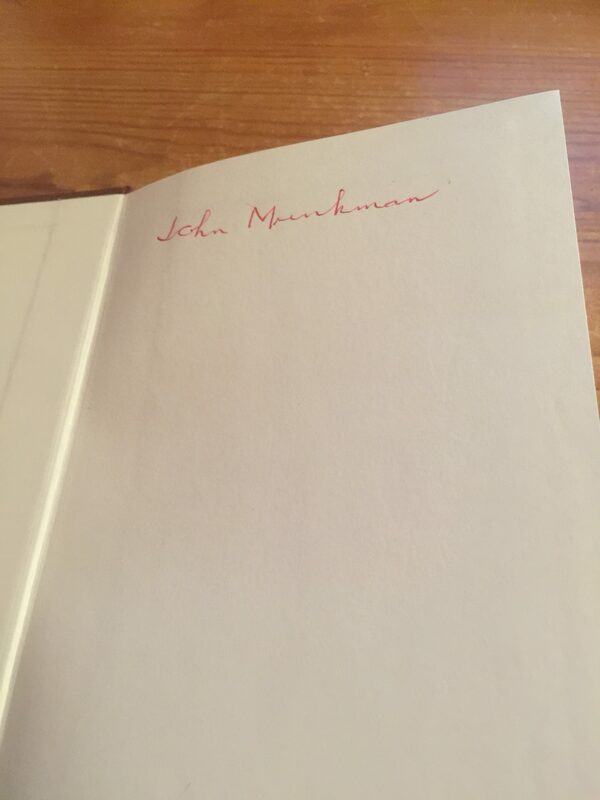 Twenty years after John Munkman’s death I find myself writing a further edition of his seminal work on damages for personal injury and death, I am also contributing chapters to Munkman on Employer’s Liability. John was a colleague in chambers for eight years. When John Behrens retired as a Chancery Judge, John Munkman was one of the people he paid tribute to in his farewell speech in court. John Munkman was a unique personality. He wrote all his books alone, unaided and using a typewriter rather than computers. John Munkman is best known for his books on Employers Liability and Damages for Personal Injury. He first published The Technique of Advocacy in 1951. My copy is a an update he wrote in 2001. It is typical of John’s work: short concise and not a word wasted. “He is one of the most colourful advocates of the current day, with a jovial, friendly presence which lights up dull moments and disarms opposition, but hides a quick turn of thought and an equally quick turn of phrase, effective in both argument and cross-examination”. 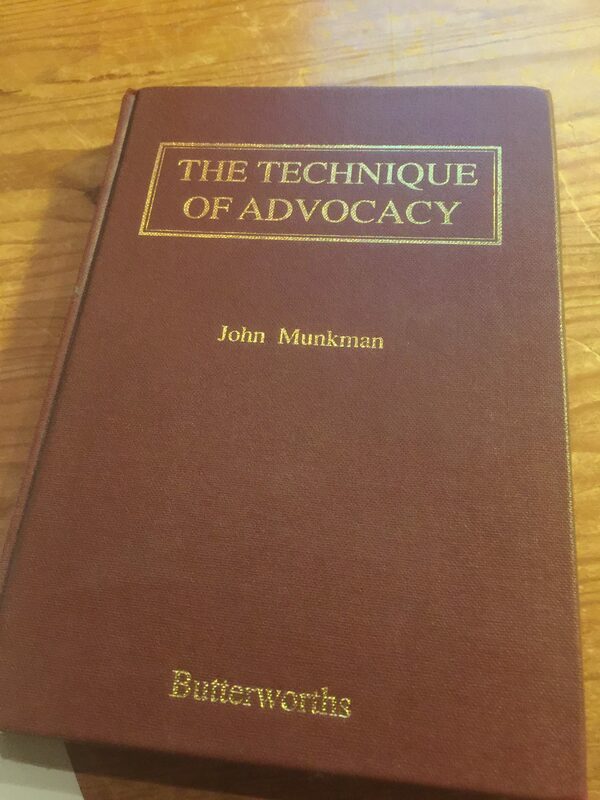 In 175 (small) pages John considers the entire scope of advocacy from its meaning and foundation, its limits, dealing with witnesses, closing speeches and general strategy and tactics. “The most honest witnesses frequently give evidence which is unsound, though they are quite sure that it is true. 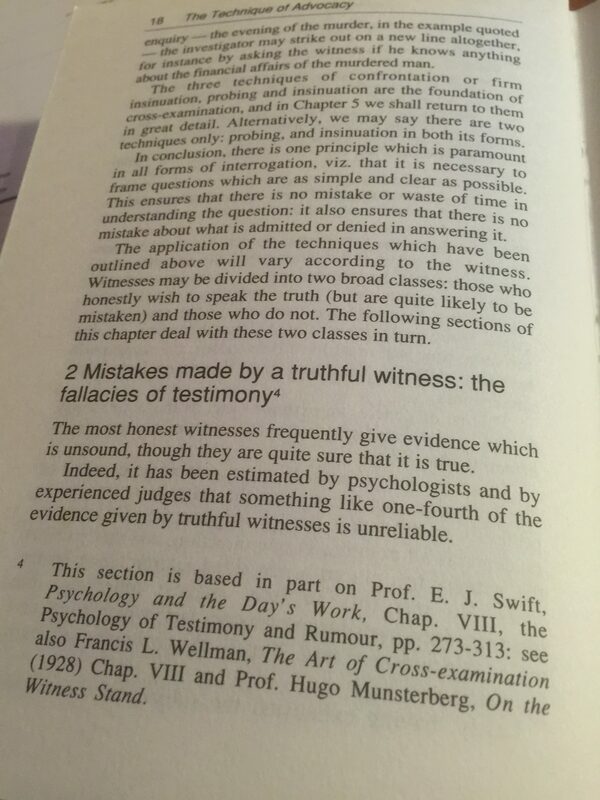 I have already written a specific post on John’s section on interviewing witnesses. This book was written long before witness statements were exchanged. An advocate would be faced with a “proof of evidence” (often unsigned). The advocate had to use the proof as the means of asking salient (non-leading) questions to adduce the witness’s evidence. “If ordinarily speaking, the case centres on the evidence – in –chief, this in turn is founded on the statements of witnesses, or proofs. … Statements ought to be taken from the witnesses at the earliest opportunity. The details fade with the lapse of time, and the evidence becomes modified under the influence of imagination. The taking of proofs is often delayed in a civil action because it is thought there will be settlement. This is a serious error. Apart from the blurring of memory, there is always the possibility that the witnesses will be interviewed by the other side, and the further risk that, by reason of insufficient knowledge, the claim may be based on mistaken grounds….. In taking a proof, it is best in the first place to ask the witness to tell his story, just noting the salient facts and dates. When the outline is clear, the statement should be taken down in chronological order, amplifying the details at the same time: doubtful points should be tested at once by a few searching questions. I am not wholly certain that John would have approved of a checklist arising out his work (indeed I strongly suspect he would not). However it is important that I highlight the major issues he has dealt with in those three short passages. 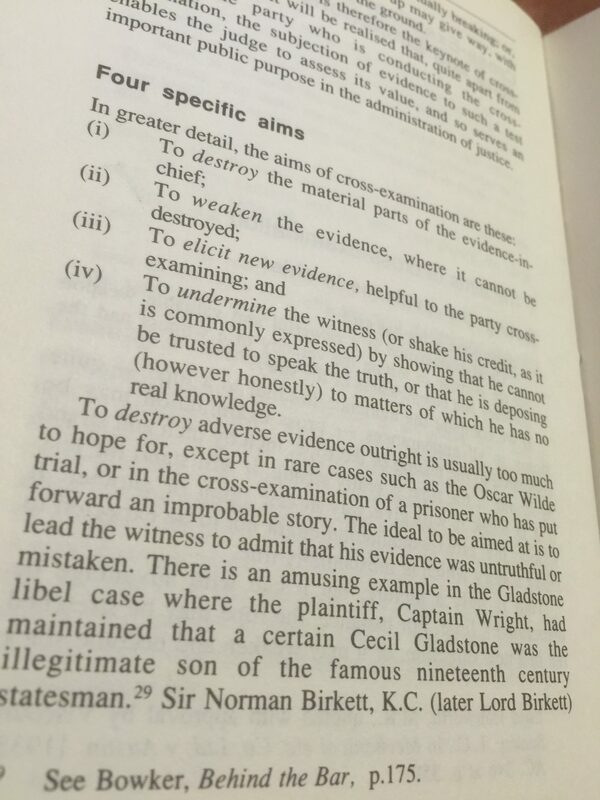 The one addition that could be made to a witness statement is that the use of sub-headings is often of great emphasis. Finally John’s section on “taking statements”. He states it is similar to taking evidence in chief. I am not sure it is still in print. If it is not it should be.